Nasty weather yesterday and last night. Ominous force 5 winds rocking Chantilly as if she were little more than a dinghy in a hurricane. In the morning, I stay below deck and, purely in an effort to settle my stomach, help myself to a dram of Laphroaig, a smoky, peaty, medicinal whisky from Islay (ISLE-la), the first stop on our wandering adventure. 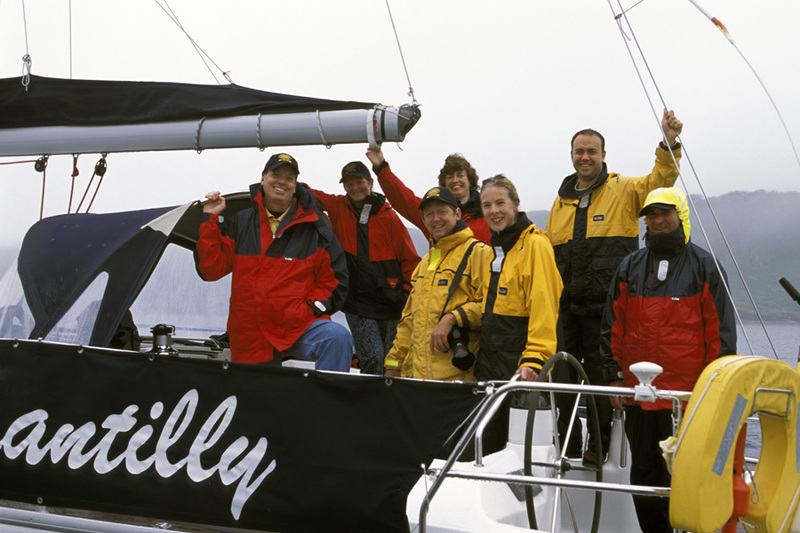 Our group aboard Chantilly. Photo by Christine Spreiter. But before we put in at Islay, I’d like you to meet Topi Morris. Topi is the cook on our cruise. 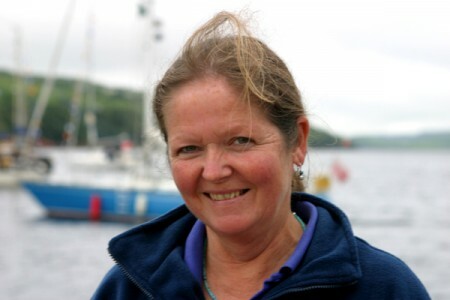 She’s also vegetarian, which worried me until dinner last night when she whipped up a Cullen skink that was as fine as anything you’d get in a good Glasgow restaurant. Most of you, I’m sure, are perfectly knowledgeable about Cullen skink, but for the two or three of you out there who aren’t, a slight digression. Cullen skink is to the Hebrides what clam chowder is to New England. In fact, it’s very similar to clam chowder, the main difference being that instead of clams, Cullen skink calls for smoked haddock. Topi’s Cullen skink is brilliant, neither too thick nor too watery. A master of Cullen skink, Topi, our cook. Photo by David Lansing. Anyway, this afternoon, Topi and I came to an unspoken understanding. She will let me sit below deck sampling from the plethora of single-malts cached in a cabinet beneath the dining table benches in exchange for me gushing about her culinary prowess. It’s an arrangement I think we’ll both find suitable to our needs. “Topi, what was that fabulous concoction you served us for breakfast this morning?” I say as I pour myself a touch more of the Laphroaig. As she give me a good two-finger pour, I think to myself that Topi and I are going to become very good friends. His name is Graham Moss, Chantilly’s captain, and he’s one of those inscrutable outdoorsy-types, one of those guys who isn’t married and doesn’t hold on to girlfriends for long because he’s always sailing single-handedly to the other side of the world or leading a small group of explorers up some ridiculous mountain peak in South America. A piper sends off my boat, Chantilly, from Oban. Photo by Christine Spreiter. Well, no, Graham, I’m sorry, I don’t. So with a huff, he breaks out an isobaric chart, spreads it across a table, and goes over such things as low pressure systems and high pressure systems and clockwise winds and counter-clockwise winds and such. Of course, I have no idea what he’s talking about. “Now du ya un’erstan’?” he says gruffly. Me irritating the hell out of Chantilly's captain, Graham Moss. Photo by David Lansing. 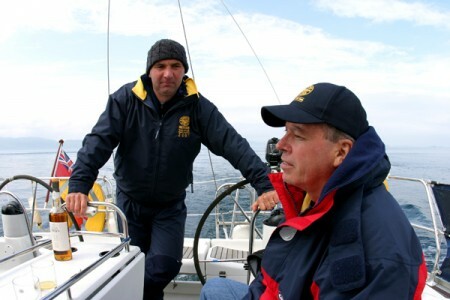 Properly disgusted, he goes back on deck to stoically stand at the helm, watching out for some big nasty-looking seabird, called a great skua, that Graham swears will swoop down on us and pluck our eyes out if we’re not vigilant. I sit out there with him. Partially to keep him company but mostly just to annoy him. It’s seems to be working. I have come to Scotland for a whisky cruise. Actually, to be honest about it, I have come to Scotland for the whisky. 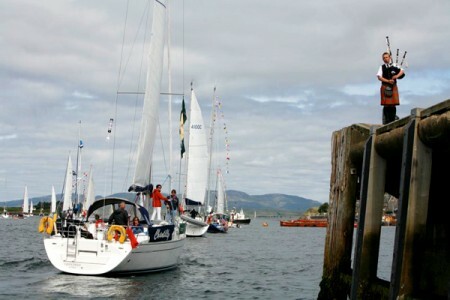 Every year, in late July, a hundred boats of every size and shape imaginable gather in the sheltered harbor of Oban, the gateway to the Inner Hebides, for a week-long sailing tour, known as the Classic Malts Cruise, of a half-dozen or so Hebridean distilleries. It sounds like something for the rich and famous, I know, but it’s not. All you need is a boat; any sort of boat, really, as long as it can handle the churlish Atlantic. After that, the entry fee is about the equivalent of a bottle of a good single-malt whisky and with that you get some hundred free whisky tastings, or nosings as they’re called. Sometimes you get to taste single malts you can’t even buy. Of, if you could buy, couldn’t afford. Which is reason enough to be here as far as I’m concerned. So with little more damage than smushing over one or two small, gray rodent-like animals that foolishly dart in front of us on the road, Michael gets me to Oban just in time to throw my bags aboard the Chantilly, my ocean-going home for the next week or so. Oban is a popular resort town with what I’d call a somewhat pimply complexion of fish and chip shops and tartan kitsch, but the biggest draw in town is the distillery which sits scrunched up against a steep hill just a block away from the Chantilly’s moorings. 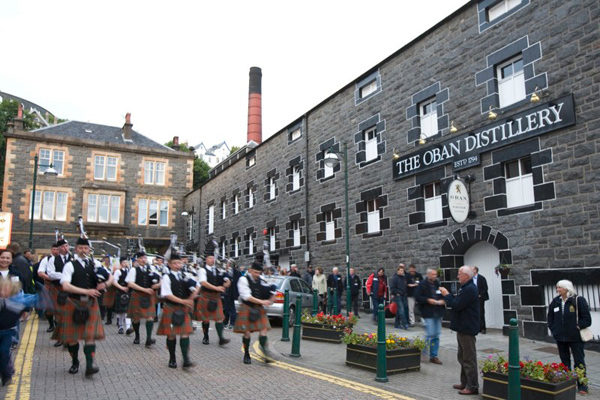 Pipe band at Oban Distillery. Photos by Christine Spreiter. Maybe I’m just imagining things, but as I walk along the Oban docks to the distillery, past the dreary War & Peace Museum which, thankfully, isn’t open, and Nevis Bakery, which displays the awards it has won for its bridie and Scotch pies, and smell the air—full of brine and seaweed, smoke and tarry rope—it’s the same pungent smells I inhale minutes later when I stick my nose into a glass of 14-year-old Oban single malt at the ceilidh held at the distillery to celebrate the start of the cruise. It’s a lovely dram. I close my eyes and take another sniff and once again, there’s very much of a smell of seaweed. It’s as if I had put my hands in wet tidal sand and then smelled them. 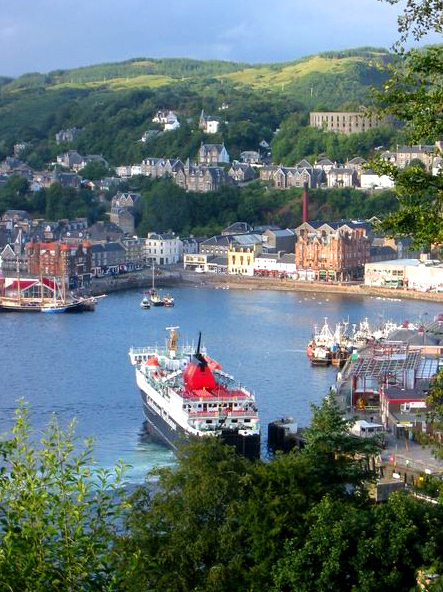 That’s what Oban—both the town and the whisky—smells like. The ceilidh (pronounced KAY-lee) is a marvelous affair, full of food and music and, of course, whisky. It’s a bit like a large family reunion picnic in the Deep South on a hot summer day with your uncles Clarence and Billy Bob standing off to the side smoking joints and drinking Southern Comfort out of paper bags while a boom box blares “Sweet Home Alabama.” Except in Oban it’s cold and rainy and Uncle Clarence and Billy Bob are a couple of bearded Scots in kilts and the music comes from a bunch of bagpipers and everyone is getting plootered on a briny 14-year-old single malt whisky. As I said, other than that, it’s pretty much the same thing. We are hurtling along a wet, curvaceous road in a fine gray mist, following the rumpled shoreline of Loch Lomond, and I am doing what I always do when I’m scared shitless: phonetically repeating, in my head, whatever it is I am hearing, which, in this particular case, is Michael’s dithering. And then it suddenly hits me: I know exactly what he is saying. Sort of. He’s saying, “That foolish old man is going to be hopping mad when a policeman tickets him for strolling down the road.” (If you don’t speak Scottish English, what he’s actually saying is, “That cakey grandad’s gauny do his bunnit if the polis tickem ‘im for daunerin’ doon the road,” but never mind that; let’s just go with my translation.) From that moment on, I understand Michael perfectly, though there is just the slightest lag time between whatever he is going on about and the translation that occurs in my brain. To wit: I’ll miss my boat if that slacker doesn’t get a move on. A reference to the old crofter puttering along in a wee car ahead of us. “Aye, wouldn’t bubble even if Ah did,” I say. And by the surprised look in Michael’s eyes reflected in the rear-view mirror, I can see that he’s quite impressed that I speak his language. I have been in Scotland for only a day or so and already I am fluid in the local patois. C’est extraordinare, don’t you think? It would seem that, as far as the Glaswegian taxi driver dialect is concerned, I am an idiot savant. “It’snaeusegaunsailinthisweather, init no?” Michael dithers. Translation: It’s no use going saling in this weather, is it? “Aye, better to find a pub and get plootered,” I tell him. Michael laughs heartily, both at the sentiment and, no doubt, at my expert Glaswegian delivery. Than, as the Mercedes’ side-view mirror rips through an overhang of wet bracken, scattering tendrils of shredded green fern across our windshield and over the car’s boot, he tells me a story, which now that I can understand him is really quite amusing. It’s about how he and his pals were at a pub in Glasgow the other night when someone nicked his beer. I don’t need to translate arse heid for you, do I? Or lavvy? Thought not. You see, you’re starting to understand Glaswegian as well. Brilliant! 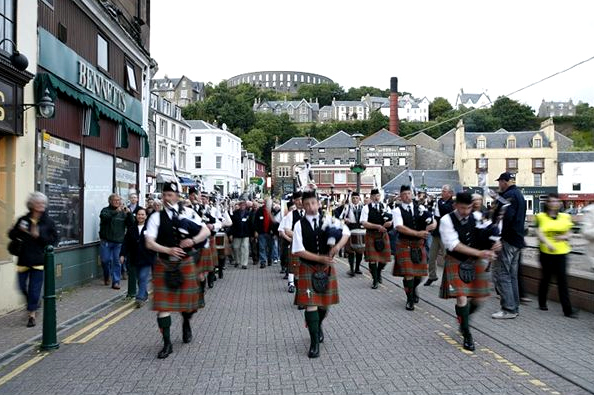 Pipers in Oban at the start of the Classic Malts Cruise. Photo by Christine Spreiter. Michael, to his credit, took this unexpected news with perfect aplomb. Shoving me into the back of the Mercedes as if I were a kidnap victim, he grabbed my luggage, tossed it in the car’s boot, and off we went down the highway like a couple of bank robbers. 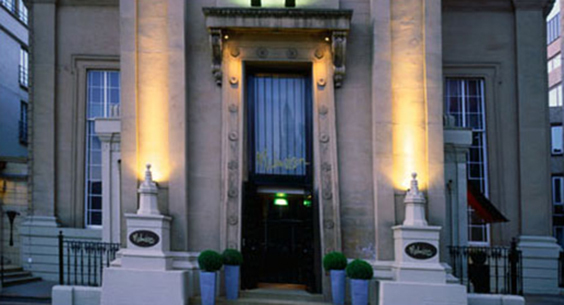 It was a huge mistake: Walking into the brasserie of my hotel, Malmaison, in Glasgow wearing the kilt I’d bought a few years ago in Edinburgh for Hogmonay. Maybe I could get by with a kilt in Edinburgh or maybe it was just because it was Hogmonay and I looked positively stylish compared to the chaps wearing “see-you-Jimmy” hats along with their kilts (a “see-you-Jimmy” hat, if you don’t know, is a Scottish tartan cap with red hair attached. As they say in Scotland, “Wi a hat like that, ye canna miss.”). But obviously I couldn’t get away with wearing a kilt in Glasgow. Certainly not at the Malmaison. 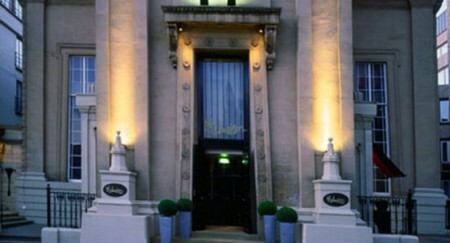 Malmaison in Glasgow, Scotland is in a former Episcopal Church. Anyway, the young receptionist, wearing a very chic pin-stripe pant suit and a silk top, greeted me with, “Oh, my!” As if were the first time she’d ever seen a grown man’s hairy legs. She looked around the almost empty bar and then pointedly led me to a table in the back. Away from the smartly-attired group of business associates celebrating some financial victory of one sort or another with a bottle of Dom Perignon, and away from the dining room proper where young couples, dressed is so much black they could have out-gloomed a room full of New Yorkers, were flirting over tea lights flickering in pale blue glasses. No sir, I was led to a little corner table next to the kitchen door where, when I’d first checked in and taken a peak at the bistro, I’d noticed two bored-looking wait-staff sullenly folding white linen napkins. Well, what did I expect. 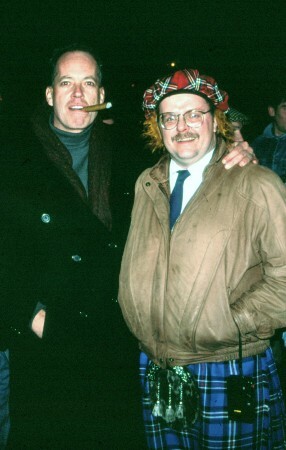 Me (with cigar) and friend in a see-you-Jimmy tartan hat and kilt. So I ordered a glass of smoky Lagavulin and nursed it for a good hour. Then I went upstairs and took a bath, the water in the pipes coming out the color of the whisky I’d just finished and having the same peaty smell as my wee dram. I only wish I’d had a “see-you-Jimmy” hat to wear in the tub.